Universal supra-nano filled resin light cure composite. Delivers exceptional wear resistance for anterior and posterior restorations. Radiopaque. Flow Quick formula is medium-flow composite ideal for Class V cervical restorations. Extended working time, superior esthetics, ideal handling, very low shrinkage, and excellent gloss and polishability. 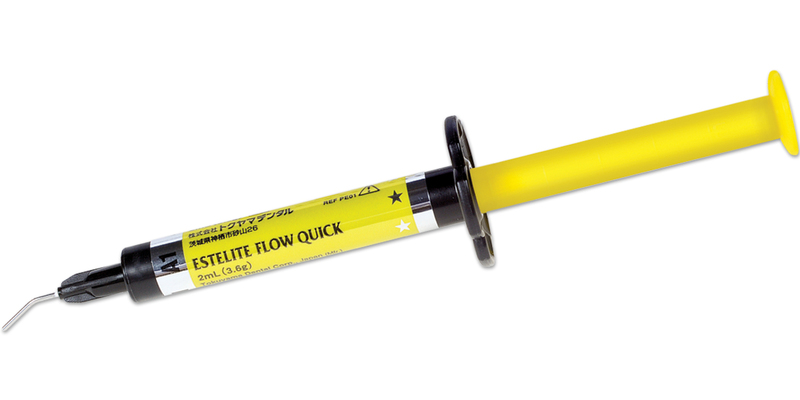 Flow Quick High Flow is indicated for Class II procedures, and has an extended 90 second working time. Designed for doctors who prefer a runnier viscosity, it combines exceptional handling with superior esthetics and mechanical strength. Contains: 1 x 2ml (3.6g) syringe, 15 applicator tips.